Sunday after the parade we went to Pastiche for a snack. 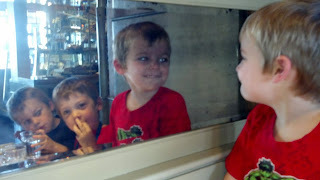 The Bunny Bee could not tear himself away from the mirror at our table. This is him practicing his Vampire look for Halloween (which apparently comes with a growl too) while the Doodle Bop looks on from the end. And the Big Guy watches himself eat a cookie (I swear he's not picking his nose). This is hilarious! Love it! Because how else do you practice your Vampire look?